Do I Need a Male Persimmon to Pollinate Giboshi Asian Persimmon? I just talked to Edible Landscape that has sold Asian persimmons a long time. Number two staff person there said owner Michael usually suspects potassium deficiency as cause of healthy Asian persimmons not bearing much fruit and recommends applying Tree Tone fertilizer fall and spring. Thought I’d pass this along. Another wrinkle in the puzzle. Giboshi (Smith’s Best)- takes a Long, long time to bear fruit per Just Fruit and Exotics so they suggest do not prune to limit height which could further delay fruiting. if your Giboshi tree produces every year a lot of flowers but only a few will result fruits, you need to graft male pollinator varieties (Maru, Chocolate, Kavkaz, Congpjong), on some branches of Giboshi tree. What about the taste of Giboshi persimmon fruits, are they really good or best (Giboshi =Smith´s best)? Yes Giboshi taste is very, very good. Will graft Chocolate this spring and hope for takes. I just bought 2 early season Izu and Sajo persimmons from local nursery. And 1 Coffee cake persimmon from Raintree . My question is Coffee Cake persimmon will have some male flower if 3 of them get pollinated . Will they become all seeded persimmon fruit? Thank you so much for your help. Vincent. 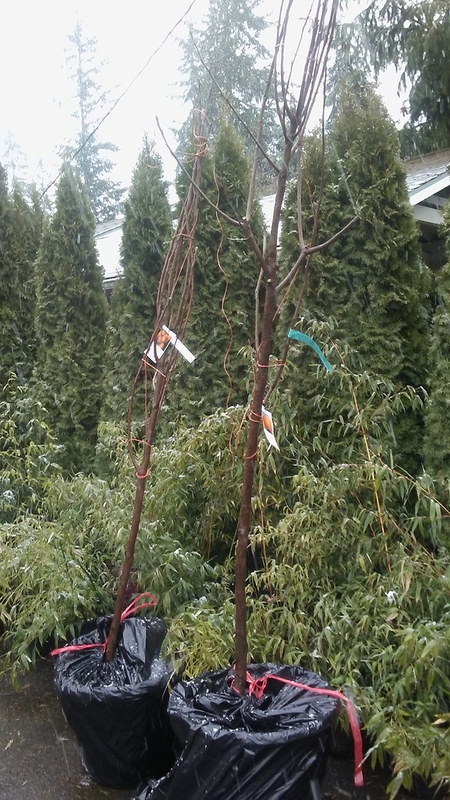 Vincent, you don’t joke around when it comes to buying fruit trees. I don’t have coffeecake persimmon, but I’m under the impression it doesn’t produce male flowers. It’s usually recommended that you get chocolate persimmon to pollinate coffeecake. Either way, all three of your trees will produce fruit, the coffecake fruit will be astringent though and will need to soften if it’s not getting pollinated. You’ll be able to tell if there is a nearby pollinator because the fruit’s flesh will turn brownish when pollinated. Some one might though I am crazy for trying to grow persimmons in Seattle short and cool summer areas. That why I try to choose the really early season verities therefore I did not choose the chocolate persimmon instead Saijo to pollinates my coffeecake. Some information on the web say Saijo will produce both male and female fower. I don’t really know yet. Thanks for your opinion Steve. I have a friend in the Bellingham area that grows Izu with good success, so I’m sure you’ll have success too. You’ll have to let us know how Saijo and coffeecake do for you. Since those trees look pretty big, hopefully you’ll know soon. What size containers did they come in? So happy to hear that Steve. I think the size of containers is about 10 gal and at least 9 ft tall. $240 for both including sale tax. Raintree nursery said Saijo do good for them, either Cloud Mountain nursery said Coffee Cake persimmon do good in Western Cascade areas as well. We almost all the same hardiness zoning that why I picked all these varieties. One Green World nursery recommends Early fuyu persimmon but it is mid season one. Had seeds in my Smiths best/Giboshi fruits last year, not sure if it produces male flowers or were pollinated by other persimmons I grow. but these are at least 40 meters from the tree. My Smith best fruits had firm skin, it bothered me. and lot of immature fruits dropped during season. I have Chocolate on Virginiana. It seems happy and healthy. I grafted it about 14 months ago. In retrospect, I’m not 100% certain is Virginiana and not Lotus. There was some confusion in the labeling from my source and it was years ago.